Join host Eunny Jang and experts Kristin Omdahl and Shay Pendray on the new season of Knitting Daily TV, now airing on local Public Television stations. Eunny walks you through the process of selecting a pattern to knit and explains how to read a pattern, pay special attention to pattern sizing, demystifies the material list, and more. Plus, she'll give a quick demonstration on how to measure gauge swatches so you can be sure to have a successful finished project even before you knit a stitch! Download Eunny's tips and technique for getting started. Join Shay Pendray as she sits down to speak with author and knitter Debbie Macomber. Learn how knitting gave Debbie an identity, how she taught herself basic skills through knitting, and became an author with her first book published in 1982. Shop on Blossom Street, the first book to combine knitting and fiction, has kickstarted her fabulous career. She now has a yarn line and patterns, available at Universal Yarn. Download the Brioche Neck Gaiter pattern, knit with Debbie's yarns. Sponsored by Universal Yarn. Visit Universal Yarn for more information on Debbie Macombers yarn and patterns. Learn how to read crochet charts and symbols with this primer from crochet expert Kristin Omdahl. Crochet charts are the universal language of crochet, and once you've mastered these skills you can read any crochet chart, no matter what language the pattern is written in. 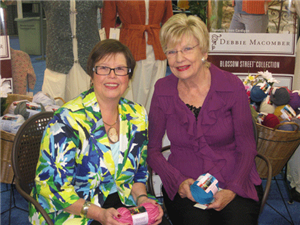 Eunny visits with celebrity knitter Deborah Norville on how she got started knitting. They also talk about great projects for beginning knitters that go beyond the scarf and only require one ball or skein of yarn. Deborah suggests using varigated yarn for your first project because its not only beautiful but hides mistakes well. She also demonstrates a fun, new way to cast-on, perfect for those that have trouble with other cast-on methods. 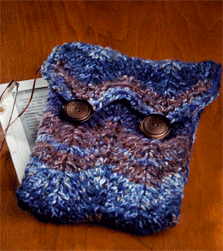 Download the Electronic Gadget Cover seen on this episode, a great way to get started knitting! Sponsored by Premier Yarns. Visit Premier Yarns for more information on Deborah Norville's yarn and patterns. Join host Eunny Jang for the first of 13 quick tips to be a more successful knitter. On this episode, Eunny demonstrates easier ways to read a pattern using highlighters and post-it notes. You'll never lose your spot while knitting again! 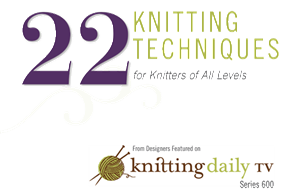 Download this tip and more with the free 22 Top Knitting Techniques eBook.